1.) "Casablanca" (1942) - Here is a film whose name gets tossed about, flung around at cocktail parties, revered by even those who haven't seen it. 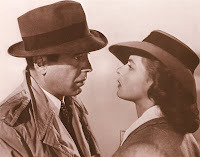 It's all for good reason, I suppose; however, to watch "Casablanca," for me, is to give a little of my soul, lose a little of my heart, be melted down and turned to mush, every time. And even though it's a heart-wrenching tale filled with sadness and sacrifice, I'm able to watch it again and again, and each time, I cry and I laugh just a little. And then in the end, I smile. 2.) "Sideways" (2004) - For me, this is the equivalent of a fiercely beloved novel, one with a broken binding and torn, coffee-stained pages that I've turned more times than I can remember. I watch it when I'm bored, when I'm cleaning, when I'm lonely, when I'm simply drinking wine. It's like an old friend, always there when I need it, never disappointing, perfectly content to be part of the background and yet usually the center of attention. I love this movie because every time I watch it, I feel like it loves me back. 3.) "His Girl Friday" (1940) - Fast-talking, fast-walking, a total whirlwind of dialogue, this movie regards women with more respect than most recent rom-coms. I love Hildy Johnson. I think she is the most intelligent woman in any movie where at least one of the main plots is a love story. I love newspapermen from the forties, and I love Cary Grant. This film is wicked smart. Much of it is ad-libbed, relying mostly on the chemistry between Grant and Rosalind Russell. "His Girl Friday" is more clever than "Juno" at its finest hour, and yet somehow remains a carefree romp through the days before the internet, before CNN, and before cell phones. 4.) "American Beauty" (1999) - Mostly, I love this movie because it's beautiful. It has a dark soul with fine lines, a grotesque underbelly and alluring demeanor. I love Kevin Spacey, and I wish that he would pick only roles like this, because Lester Burnham is tortured, and he's a prisoner in his own home, his own body, his own pathetic existence. But it's not so pathetic, and that's the beauty of it all. I like the idea that death brings clarity, or at least that the thought of death brings clarity. I like all of the different people in this movie, how they come together under strange and innocent circumstances, and then, finally, how that innocence is transcended to hope, loss, and, of course, beauty. I've seen this movie countless times, and each time, I'm left tearful and breathless. 5.) 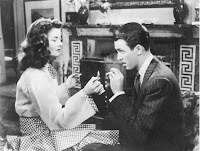 "The Philadelphia Story" (1940) - Jimmy Stewart is among my favorite actors, and this is not only the film that won him an Oscar, but it's also the film that made me love old movies. Based on the play by Philip Barry, it is fierce with its dialogue and unrelenting with its characters. I love Jimmy Stewart in this movie more than any other movie. I love Katherine Hepburn no matter what she's in, and here, she's truly at her best. Love triangle movies can often get caught up in their deception, forgetting about their characters completely, but this movie is more of a love parallelogram, and it never once neglects its stars. Cary Grant is softer than usual. Jimmy Stewart is harder. Katherine Hepburn is empowered yet frightened. It feels like an old movie, yet it moves like something else completely, because everything is just so unexpected. This is one I like to watch with my best friend. 6.) "E.T. : The Extraterrestrial" (1982) - Is there any other movie that, beyond any semblance of a doubt, holds the power to encapsulate one's entire childhood? Well, maybe you don't feel that way, but I do. 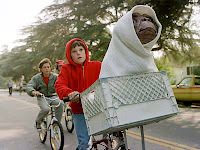 When I watched "E.T." a couple weeks ago, I felt enamored, painfully nostalgic, and lost in a dreamland that can exist only in a place I like to call Spielbergia. This movie makes me remember the happiness that comes with Reese's Pieces, what it's like to ride a bike, even if it's not over the moon, and the joys that come when you believe in something with all your heart. It's a sad movie, and a frightening one as well, especially for a child who cannot understand why anyone would want to harm such a special being. I had an E.T. stuffed animal when I was little, and I have to admit that I simultaneously loved and feared the poor thing, because so much about that movie scared me. But it also enchanted me, and it didn't matter how much I cowered away from those long, treacherous tubes, I still watched and waited for the magical end, and it always came. It still does every time. 7.) "Eternal Sunshine of the Spotless Mind" (2004) - This movie, I feel, does today what romantic comedies haven't done since, well, the forties. I can't describe it. It's something with the characters. Kate Winslet is beautiful and strange. Jim Carrey is bumbling and soft. And when they come together, it's like watching Clark Gable and Claudette Colbert, only different and new and completely colorful. It's the only real modern love story we have. I love it because whenever I watch it, I'm reminded of a time when love stories weren't all farces, and when their characters had brains and moving parts all of their own. 8.) "Annie Hall" (1977) - La dee da. La dee da. La la. I think many people will agree when I say: I have no idea what it is about this movie. Why Woody Allen is so charming. Why Diane Keaton is so, well, hot. I love the eccentricity of it all. The whole thing intrigues me: How Alvy derives anti-Semitism from everything, everyone, everywhere. How Annie simply wanders and giggles through a seemingly effortless life. But then, it's not all so effortless. There are qualms, many of them so typically Woody, many so strange and unexpected, that one can't help but watch as it all comes together. Or comes apart. Whatever you want, I suppose. That's the joy of Woody Allen. People just talk and talk and talk, and eventually, something happens, and no matter what your quirks and troubles, you're like, "Whoa, I love this." 9.) 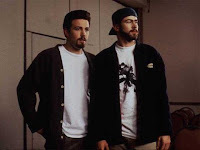 "Chasing Amy" (1997) - I had to have a Kevin Smith film on this list, but it's not only that. "Chasing Amy" is filled with all the parts of real life that matter, only they're injected with that quick, Smithian wit, and it's so tight, so restrained in the way that it gives us things. I watch it for Holden's monologue, for Hooper's Star Wars metaphor, for Alyssa and the dart-throwing scene, and the strange, backwards love triangle. "What's a Nubian?" Seriously. It's filled with wonderful, engaging dialogue that often borders numerous taboos. It's rough and poetic in the way that its characters reveal themselves. It's life in the View Askewniverse. Who doesn't want to be a part of the View Askewniverse? And if you don't know what I'm talking about, who are you? Two words for you: Snootchie Bootchies. You know! 10.) "Toy Story" (1995) - Well, of course it's a pioneer. The first all CGI feature length film. And who doesn't secretly worship every drop of sweat that goes into making these PIXAR films? I especially love "Toy Story" because of its sweet and unique characters, the realistic ways they react to things, even though they're, well, toys. This movie makes me smile because of things like, "Son of a building block! It's Woody!" and that opening scene when Woody defeats the evil One-Eyed Bart as played by toy-owner Andy. So much novelty. Every time I watch it, I discover a new joke, a new nod, or a new wink. It's the first PIXAR treasure, but it's also the best PIXAR treasure, because it's got that whole thing down where it entertains kids with lots of color and movement, but it also entertains adults with frequent innuendo. I love it.